Can you add my one question to your survey? No sooner you let it be known, mostly inadvertently, that you are about to send out a survey to customers than starts incessant requests (and commands) from your co-workers (and bosses) to add just one more question to it. Just one more question they have been dying to find the answer for but have not gotten around to do a survey or anything else to find the answer for. Just one question right? What harm can it do? Sure you are not opening the floodgates and adding everyone’s question, just one question to satisfy the HiPPO? May be I am unfair to all our colleagues. It is possible it is not them asking to add one more question, it is usually us who is tempted to add just one more question to the survey we are about to send out. If survey takers are already answering a few it can’t be that bad for them to answer one more? The answer is yes of course it can be really bad. Resist any arm-twisting, bribing and your own temptation to add that one extra question to a carefully constructed survey. That is I am assuming you did carefully construct the survey, if not sure add them all, the answers are meaningless and in-actionable anyways. To define what carefully constructed survey means we need to ask, “What decision are you trying to make with the data you will collect?”. If you do not have decisions to make, if you won’t do anything different based on the data collected or if you are committed to do whatever you are doing now and only collecting data to satisfy the itch then you are doing it absolutely wrong. And in that case yes please add that extra question from your boss for some brownie points. So you do have decisions to make and made sure the data you seek is not available through any other channels. Then you need to develop a few hypotheses about the decision. You do that by doing the background exploratory research including customer one-on-one interviews, social media search analysis and if possible focus groups. Yes we are actually paid to make better hypothesis so you should take this step seriously. For example your decision is how to price a software offering and your hypotheses is about value perception of certain key features and consumption models. Once you develop a minimal set of well defined hypotheses to test, you design the survey to collect data to test those hypotheses. Every question in your survey must serve to test one or more of the hypotheses. 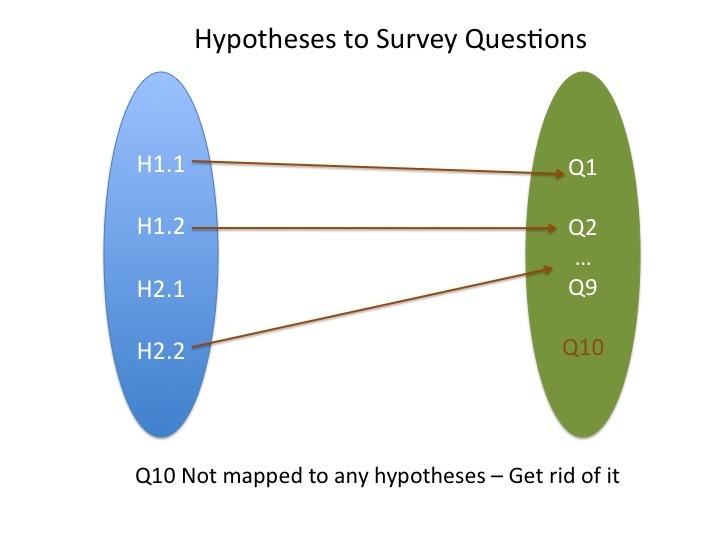 On the flip side you may not be able to test all your hypotheses in one survey and that is okay. But if there is a question that does not serve to test any of the hypotheses then it does not belong in that survey. The last step is deciding the relevant target mailing list you want to send this survey to. After all there is no point is asking the right questions to wrong people. Now you can see what adding that one extra question from your colleague does to your survey. It did not come from your decision process, does not help with your hypotheses, and most likely not relevant to the sample set you are using. Does preschool lead to career success? If you are reading this article it is highly likely your child has been in preschool or will attend preschool. But pick randomly any child from US population, you will find that only 50% chance the child goes to preschool. What is the observed difference in their later performance of those who attended preschool and those who didn’t? 50% of children don’t get to attend preschool because of economic disparity. Seems only fair to democratize the opportunities for these children and provide them free preschool when their parents can’t afford them. I do not have a stand on fairness but I have a position on the reported research and how they drew such a causation conclusion. First I cannot make judgement on a research when someone simply says, “research says”, without producing the work, the data that went into it and the publication. Let us look at two possible ways the said research could have been conducted. Cross-sectional Analysis – Grab a random sample of successful and unsuccessful adults and see if there is statistically significant difference in the number of those who attended preschool. As a smart and analytically minded reader you can see the problem with cross-sectional studies. It cannot account for all different factors and confuses correlation with causation. Longitudinal Analysis – This means studying over a period of time. Start with some preschoolers and some not in preschool and track their progress through education, college and career. If there is statistically significant difference then you could say preschool helped. But you, the savvy reader, can see the same problems persist. Most significantly it ignores the effect of parents – both their financial status and genes. A parent who enrolls the child in preschool is more likely to be involved in every step of their growth. Even if you discount that, the child is simply lucky to start with smart parents. So the research in essence is not actionable. Using it to divert resources to invest in providing preschool opportunity to those who cannot afford is not only misguided but also overlooks opportunity cost of the capital. What if the resources could actually help shore up elementary, middle or high-school in low-income neighborhood? Or provide supplementary classes to those who are falling behind. Failing to question the research, neglecting opportunity costs and blindly shoveling resources on moving a single metric will only result in moving the metric but with no tangible results. 14% of millionaires are teachers – does that mean becoming a teacher is a way to riches? http://t.co/eXf96rgi P(T | M) = 0.14, P(M | T)=? I saw a Statistic that said 14% of the millionaires in US are teachers, second only to managers and ahead of lawyers and doctors. Given this and what you know about teachers, what percentage of teachers do you think are millionaires? About same? Higher? Lower? Write down the first thought that comes to your mind. My preconceived notion, based on what I can selectively recall, is there are far fewer millionaires among teachers compared to rest of population. In other words, while 14% of the millionaires are teachers, far fewer proportion of teachers are millionaires. Until I did the math. What we want is given someone is a teacher, how likely is that teacher a millionaire, that is what is P(M | T). Data from US Census says, there are 7.2 million teachers and 8.6 million people are millionaires. That means P (M | T) is 16.8%, or one in six teacher is a millionaire. That does correct the stereotype I had about teachers. Does this mean if you became a teacher (and you are not already a millionaire) then your chances of becoming a millionaire is 16.7%? 46% of the millionaire teachers reported they got there through inheritance. A good portion reported having second income through working spouse. Few more became teachers after becoming millionaires because they had the financial flexibility to do whatever they liked. Taking these numbers out, that means only 4 to 8% of the teachers became millionaires because of the profession. That is still a high number and includes a broad class of teachers including college professors. So there you have it. One in six teachers in US are millionaires but if you want to become a millionaire by choosing teaching profession your chances are less than one in twenty.